A $40-million, five-story building that contains state-of-the art research facilities, classrooms, and teaching laboratories. The first floor is dedicated to teaching spaces. The second and third floors house the Department of Biomedical Engineering (BME), the RCBU main office, and BME faculty research and teaching labs. Optics research and teaching facilities are located on the fourth and fifth floors. The Center for Institute Ventures, also housed on the fifth floor, helps faculty members commercialize their research and innovations. This laboratory provides facilities for testing of the strength and functional performance of biological tissues and other materials used in biomedical applications. For example, in BioSolid Mechanics, students prepare specimens and learn to use a materials testing system to compare various musculoskeletal tissues to traditional engineering. This laboratory provides general facilities for microscopic imaging of tissues, cells and intracellular structures. Each microscope is equipped with video-capture systems to allow investigation of cellular motion and adhesion, which are critical in the interface between cells and their environments. These facilities may be used in the Cell & Tissue Engineering and Biomedical Microscopy courses, and other specialized graduate courses. This laboratory provides facilities for culturing cells and tissues as a basis for learning about cell function or developing cell-based therapies for tissue repair and replacement. Laminar flow hoods provide sterile conditions for culture procedures. For example, in Cell and Tissue Engineering, students learn about sterile technique and the effects of matrix composition on cell behavior. This laboratory is used in BME 230: BME Signals & Measurements, where students learn to use a variety of instrumentation and signal processing methods to study biological behaviors. Also, in BME 260: Quantitative Physiology, students apply engineering principles to study physiological function in living systems. The Integrated Nanosystems Center consists of a 1,000 square-foot metrology (measurement) facility and a 2,000 square-foot, cleanroom fabrication facility. The nanosystem programs at the University of Rochester are unique because they allow for the production of high temperature nanomaterials and incorporate the University's expertise in optics and optical device technology. Located in the Wilson Quadrangle on the River Campus between Wilson Commons and Morey Hall, the three-story, 18,900-square-foot building features an engineering fabrication lab where students can build project prototypes, a multipurpose learning studio, group study areas, and exhibit space for students to display their projects. The building also contains sound and video recording studios, high-end computers, and 3-D printers, which represent the latest manufacturing technique to convert digital design software into actual models. The electron microscopy facility for the University of Rochester is located in the Institute of Optics' Wilmot Building. The facility serves the entire academic campus as well as some Medical Center activities. The Rochester Center for Biomedical Ultrasound (RCBU) laboratories are advancing the use of ultrasound in clinical diagnosis and discovering new therapeutic applications of ultrasound in medicine and biology. Innovations in biomedical ultrasound require the collaborative expertise of engineers, physicians, basic scientists and clinicians. The RCBU provides an ideal forum to stimulate cross-disciplinary research. 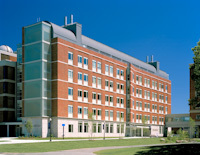 The core facilities provide services to all researchers at the University of Rochester School of Medicine and Dentistry.